Mrs Benton came to WGHS as a mature student, to do her final teaching practice, in 1974/5. As she finished, a job became available and she taught English and History until her retirement, about 20 years later. An Old Girl of King Edward's, Camp Hill, she enjoyed the all- girls' environment and quickly became involved with our school's life and its associated activities, despite losing her husband in 1976 and bringing up two teenage children. She took a Drama course and put on a number of plays; she became the school's librarian and enjoyed training junior librarians and she loved being a "first-form" form mistress. When all the Gilbert and Sullivan operettas and other Musicals were put on, Mrs Benton organised teams and was responsible for all the make-up. Whenever an extra pair of hands was needed, Mrs Benton was there, organising theatre trips, helping out on visits to concerts and giving up holiday to travel abroad with school groups to France, Germany, Italy and Greece. 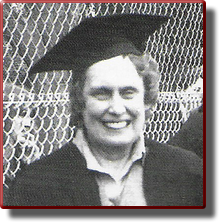 Since her retirement, she had been a staunch supporter of the school and a long term member of the Friends' Association's committee. An able flower-arranger, she produced floral decorations at the suppers until shortly before her death in March 2016, aged 83 years. Tributes to 'Midge' Benton – English Teacher – from the Facebook page…. Lisa Fernand Mrs Benton - my first form teacher in 1L in 1980. Formidable indeed. She alluded to her crush on Ted Hughes on more than one occasion and gave me a lifelong love for Shakespeare and Philip Larkin. A great teacher with a passion for her subject. You wouldn't mess with her though! Kathryn Tullett I remember Mrs Benton reading Pooh Bear stories sat on the stage in between house plays! Giselle Kelly I'd forgotten about that!! Helen Cooper I remember her writing on the chalk board and then getting carried away and stepping off into the bin alongside the raised area! Melanie Hallam Mrs Benton was the reason I ended up in teaching. I left 6th form in 1987 to join Barclays Bank. She begged me to reconsider and told me that banking would bore me to tears (she was right). She told me I should be a teacher which seemed ludicrous at the time as I couldn't wait to leave school and get out into the big world. Her words haunted me and in 1995 I left banking and did an English degree, followed by teacher training. I have been a teacher for 18 years and am now a Head of Department. Her name often crops up when I am having very similar conversations with students about the importance of higher education.